Place a large pot of cold water on the stove top and bring to a boil while you prepare your mise en place. Once the water is boiling, season with salt. Note: Season the water with approximately 1 tsp per litre/quart of water. To prepare your mise en place, first clean and slice the mushrooms. Emince the garlic. Remove the leaves from the thyme and roughly chop. Do the same for the parsley. Grate the parmesan cheese. Cut the prosciutto into bite-size pieces. Drain and squeeze the excess oil from the sun-dried tomatoes and measure 1/3 cup. Cut them into julienne strips, if needed. Measure out the white wine, cream and chili flakes and set everything aside. To start the dish, heat a large, stainless-steel fry pan over high heat. Once hot, add the grapeseed oil, immediately followed by the mushrooms. Season with salt and pepper to taste. Saute the mushrooms until they start to turn golden and then add 1 tablespoon of the butter. Pasta Note: For this recipe we used fresh, hand-cut pappardelle noodles. You may want to double the Basic Pasta Dough recipe to serve 4 people. If you are using fresh pasta, don’t start cooking it until the sauce is almost done, as it will only need a few minutes to cook through (see note below). Dried pasta (rigatoni, penne, cavatelli, bow tie or fusilli) also works very well. If using dried pasta, add it to the boiling, salted water now and stir. Let cook while you finish the sauce. 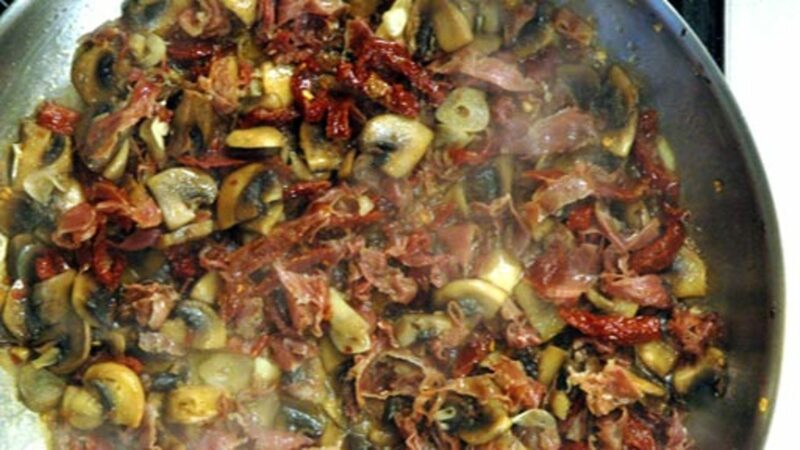 To continue with the sauce, once the mushrooms are golden brown, reduce the heat to medium-high and add the prosciutto. Once the prosciutto is heated through, add the chili flakes and garlic. Let cook until the garlic is fragrant, about a minute or so. If the mixture looks a bit dry, add in the other tablespoon of butter. Next, add the sun-dried tomatoes and deglaze with the white wine. Stir, scraping up any bits from the bottom of the pan. Let the white wine reduce almost completely before adding the cream and thyme. Reduce the heat. Let the cream simmer and reduce slightly. Pasta Note: In the meantime, check the dried pasta for doneness (if using). If you are using fresh pasta, start cooking it at this point. It will only take a few minutes to cook through and become tender. Once the pasta is done, drain, reserving approximately 1 cup of the cooking water. Transfer the drained pasta to the sauce and toss gently to coat. Use some of the reserved pasta water to thin the sauce down, if necessary. The sauce should just coat the pasta. Sprinkle the parmesan cheese and chopped parsley over top and toss gently to combine. Taste for seasoning. Serve in warmed bowls. Top with additional parmesan cheese, chili flakes and a splash of extra-virgin olive oil, if desired. This pasta dish is not extremely “saucy”. The pasta is just lightly coated with the delicious sauce. Increase the quantity of the sauce if you prefer a saucier dish. It is great served with some nice, crusty bread and a light salad. The color and flavor of the dish was awesome. This is a recipe I will keep for quite some time. I wish the sauce was saucier. Next time I will double to recipe for a saucier dish. Overall, very good. I used about the same measurements of Irish smoked salmon as the recipe called for in prosciutto, and it worked like a charm. Added the salmon after the cream but before the pasta, and otherwise followed the recipe pretty religiously. Might even add some espilette instead of chilis next time for that yummy warm feeling. The pinot was perfect. The extra butter to sweat the garlic confused me, until I added the wine and it almost instantly became a sauce that reduced beautifully. As always with the Rouxbe recettes, it was perfect and really satisfying. Great job, Kimberley! I am planning to make this dish for a birthday dinner. the only thing is, i really dislike mushrooms! i have tried various kinds and the texture really just isn't my favorite. should i just leave them out, or is there something i could substitute that would also fit well with the dish? thanks! While this particular dish is made using mushrooms, as the cook you are free to make substitutions and/or deletions as you choose. 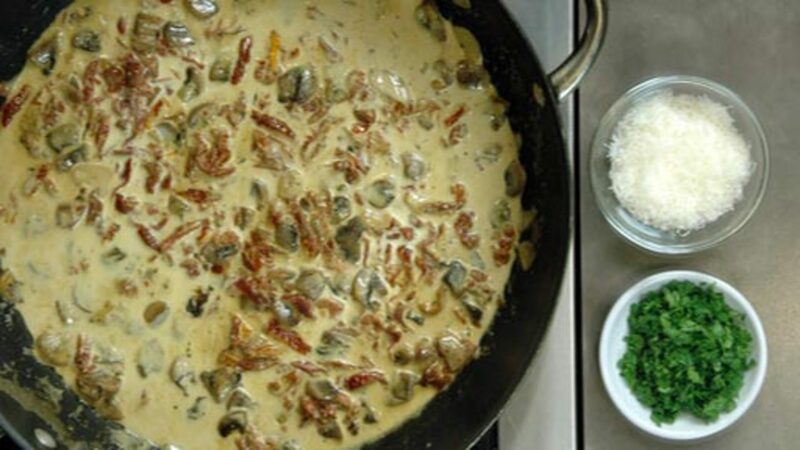 There really are no substitutions for the wonderful earthiness of mushrooms so if you choose not to use them then the dish will definitely be different in terms of flavor, color and texture. Cheers! Wow, this dish was a real winner! It was very delicious and quite easy to make. Based on the recommendations I increased the sauce by maybe one-third to one-half (just kind of estimated) and it was plenty saucy. I'll be making this one again soon. Some sun-dried tomatoes are less acidic than fresh tomatoes. However, this can vary. The amount of acid will vary depending on the type of tomatoes, ripeness and where they were grown, how they were packed etc. As for adding them to a sauce, you may need to experiment with the ratios and the amount of oil in the tomatoes if making a sauce or a roux but it can be done. Cheers! This sounds so yummy, and simple. As an alternative to making fresh pasta, could I use store bought lasagna sheets (from the deli, not dried) and cut them into strips? Or would this pasta be too thick? You could, but it is often too thick. If you want to try it and find that the deli pasta is too thick, you could also run it through a roller a couple of times to thin it out. Really though, if you have a pasta roller, fresh laminated pasta is really quite easy to make (and tastes way better). Dried pasta also works very well for this dish. Cheers! Thanks Kimberley. I do have a pasta roller so will probably end up making it from scratch after all. My mouth is watering just thinking about this one. Making is for tonight, homemade pasta and all. Do you have any guidelines on how fat the cream should be? You are looking for a heavy cream, often sold as whip cream, that has a milk fat percentage of at least 33%. Good luck and enjoy your dinner! What exactly will the effect be in taste if the wine is left out? The wine provides a nice balance of acidity against the cream. If you don't want to use wine, you could try a splash or two of white wine vinegar or a splash of lemon juice instead. Cheers! Made this last week. Thought it might be tough but it wasn't at all. Loving all the dried tomatoes! I made this for my level one course lesson! It was simply amazing. I couldnt find fresh Pappardelle but I found an incredible quality dried version: Cipriani. It was thin and soaked up the sauce prefectly. I will use it again. I forgot to save a cup of the pasta water and my sauce could have used some thinning but all in all it was perfecto! I think I will add a few more wild mushrooms next time but that is all I would change. The 1/4 tsp pepper flakes were the perfect heat. I will definitely repeat this for a dinner party. I can't wait for left overs tomorrow! My culinary classes made this dish with freshly made tomato pappardelle and used diced pancetta in place of the proscuitto. It was delicious and a class favorite. This was amazing. Was trying to save some for my girlfriend for her lunch, but I had a tough time stopping eating... I had a Barilla dried fusilli, and it worked really well. The coil held the ingredients quite well. Thank-you. Oh good, that sounds delicious. Keep up the good work. This evening, Tomato, mozzarella and basil salad, Pasta Boscaiola and fresh made crusty bread. Spent the time this afternoon making the pasta the bread but the meal, this is what it is all about. Love the learning. I have to agree with the above comments. Great recipe. Thanks Kimberly and everyone involved! I made this today for lunch and it was excellent!! But when we reheated it for dinner it wasn't nearly as good. It was a little greasy rather than creamy. How would you suggest rewarming this dish for a better result? Reheating dishes like these can be tricky — most often, they are at their best when they are first made. If you are going to try to reheat it, do so slowly, over lower heat. Cheers! This is without a doubt the best pasta dish I have ever had. Thanks so much for the recipe. Hi Rouxbies, I just finished your Forks Over Knives online cooking school (wonderful stuff, btw) and was a little surprised to see these ingredients. Is there a vegan version of this recipe for those of us that are using FOK? Meryl, we don't have a separate plant-based version written up, but just a few changes will get it there. 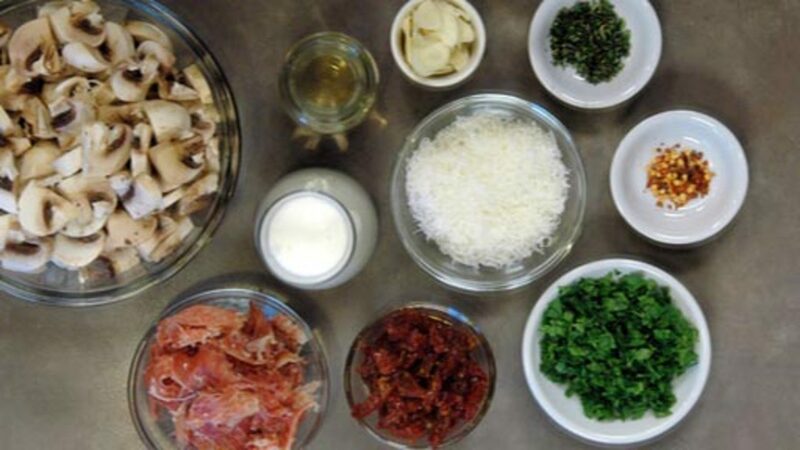 1) Omit the prosciutto or replace it with firm or fried tofu; 2) replace the heavy cream with a nut-based cream, e.g. cashew cream; 3) replace the parmesan with nutritional yeast or a crushed nut 'parmesan' using nutritional yeast; and 4) replace the butter with olive oil or other plant-based fat.